Mice that were fed bitter melon were 60% less likely to develop pancreatic cancer as well. Further research conducted (Oishi et al. 2007, Kumar Shetty et al. 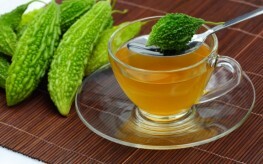 2005) has shown that glucose metabolism begins in the gut, and as carbohydrates and sugars are metabolized to glucose before leaving the gut, bitter gourd reduces the amount of sugar (glucose) released into the body by inhibiting enzymes that break down disaccharides to two monosaccharides. Diabetes soars in Asia – Research published in the Journal of American Medical Association on Wednesday said the disease has turned into a global problem, with the number of victims expected to grow from 240 million in 2007 to 380 million in 2025. More than 60 percent of those will be in Asia, the world’s fastest growing region, with low- and middle-income countries hardest hit. India will see its numbers grow from 40 million to nearly 70 million; China 39 million to 59 million; and Bangladesh 3.8 million to 7.4 million, the authors wrote, citing figures from the International Diabetes Federation. Indonesia, the Philippines, Malaysia, Vietnam and others will also see their figures skyrocket.